If you need a qualified commercial roofing contractor in Knoxville, Tennessee, then turn to the experts at Arango Insulation. We offer outstanding roof systems from highly reputable manufacturers, and we perform efficient work in every project we undertake. 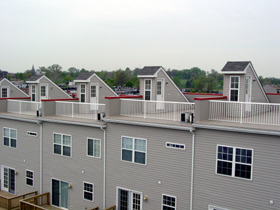 We have the knowledge and expertise to install roofs on all types of commercial buildings, though we specialize in serving as commercial roofing contractors for for large-scale, multi-family dwellings such as apartments, townhomes, condominiums, and other similar structures. When you hire Arango Insulation to install a roof for a commercial building, you can rest assured that the work will be performed by highly trained professionals who will use nothing but the finest materials available. For every commercial roofing project in Knoxville, TN, we have an expert project manager to oversee our experienced roofing team, ensuring each aspect of the job is performed correctly and that the over project remains on schedule. And, we only install roof systems from GAF, CertainTeed, Tamko, Versico, GenFlex, and Owens Corning, all of which are renowned manufacturers known for producing durable, energy-efficient roof systems. In addition to serving as a commercial roofer, we also perform several other commercial services, including waterproofing, fireproofing and installing building insulation. So, whether you need commercial insulation installers or have a commercial roofing project in Knoxville, TN, turn to the professionals at Arango Insulation and ensure the job is done right the first time. Contact us today.